This article covers virturalization technology, obtaining VMware Beta 2.0, how to install VMware Beta 2.0, new key features and how to create your first virtual machine. Virtualization technology enables you to run multiple virtual instances of a system within a single system or cluster of systems. The most popular and, in my opinion, the fastest-growing company to specialize in virtualization technology is VMware (VMW). VMware was founded in 1998 by Edouard Bugnion, Scott Devine, Diane Greene, Mendel Rosenblum, and Edward Wang. For our tests we used very common commodity hardware. We simply used a desktop PC running Microsoft Windows XP Pro on a Pentium(R) D 3.20GHz with 2GB DDR. New web-interface. Yep, that’s right, no more VMware Server Console to manage your VM’s. While I see this to have multiple Pro’s and Con’s the web interface has seemingly grown on me. The new web access interface also comes with independent virtual machine consoles. 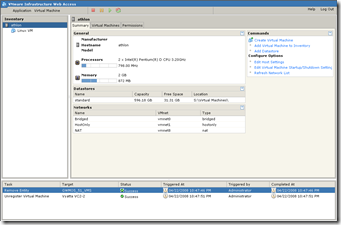 This allows you to have multiple separate windows to view your running virtual machines. New (but old) methodology. 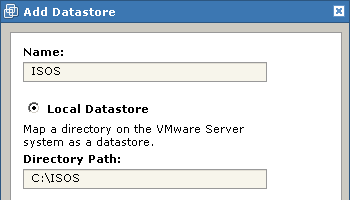 The new VMware Beta uses the term "Datastores" to describe locations for data. This is very similar to its big brother VMware ESX Server. 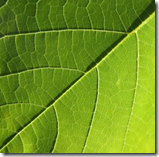 VMware Beta now supports USB 2.0 – transfer files faster! Open www.vmware.com in a browser. 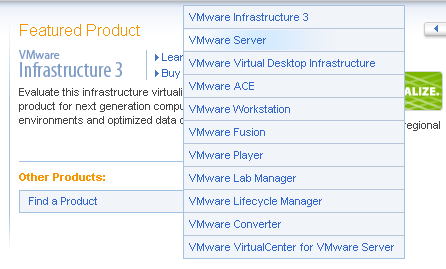 Locate "Other Products" and hover over "Find a Product" and select "VMware Server"
Locate the link that says "VMware Server 2.0" or click here. Fill out all information on the registration page or use the seemingly new feature at the top prompting you to enter your email if you have already registered for a VMware product. Agree to the EULA (End User License Agreement) by pressing "Accept" at the bottom. You are now presented with the download page (finally right?) Take special note of the serial numbers in red. Q: Wait! Where’s the VMware Console Download? A: We’ll cover that later in the article. Don’t worry! Locate the file you previously downloaded and execute the installer. 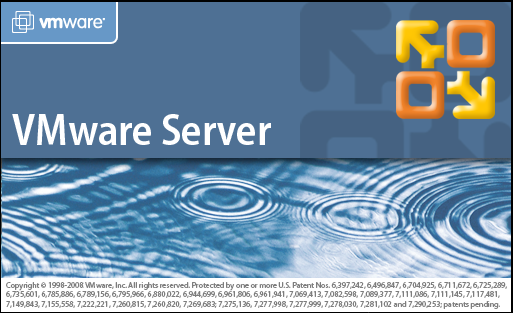 This article covers installing VMware Server 2.0 on Windows XP Pro. You are first presented with a progress bar, and then the infamous installation wizard. Press "Yes" to verify the MD5 sum of the downloaded package. 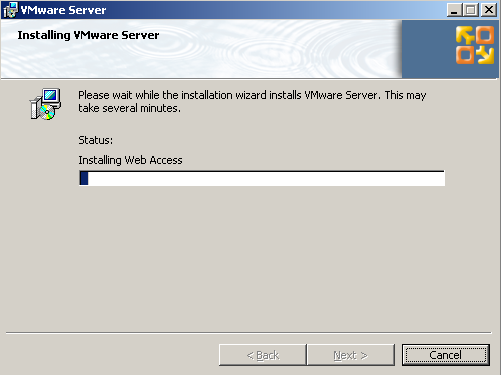 After some waiting and some random screens and progress bars you are now presented with the VMware installer. Press "Next" to begin the installation process. Accept the license agreement once again. Insert your serial number as noted on the download page. Specify an alternate folder (if desired) and press "Next"
You are now presented with FQDN (Fully Qualified Domain Name), Server HTTP Port, and Server HTTPS Port options for your installation. I would simply leave the defaults unless one of the ports conflicts with another application/server on your system. Select the defaults for shortcut creation and press "Next"
Press "Install" to start the installation. Once the installation has completed press "Finish". Press "Yes" (after saving all important work of course!) to reboot your system. Creating your first virtual machine is easy! This section will outline the basic setup and installation of your virtual machine and guest OS. I guess now is a good time to describe what it means when you read about "Guest" and "Host" Operating Systems. A Guest Operating System is an OS which runs inside of a virtualized environment. A Host Operating System is an OS which runs all virtual machines. The Host Operating System in our lab is our Windows XP Pro machine. Enter your computer login information (your username and password for your machine) and press Log In. After the initial screen loads you’re probably thinking "Woah, this is completely different!" and you couldn’t be more right. VMware is taking the whole web approach very seriously in this web-client. Click on the right to create a new VM. Select your Guest Operating System. * Note: 64-bit support can only be enabled if your host system supports 64-bit technology. Specify the memory size. The recommended is usually acceptable when running VM’s in testing mode. For our Linux VM we’re sticking to 256MB. Select one processor unless you explicitly need two. 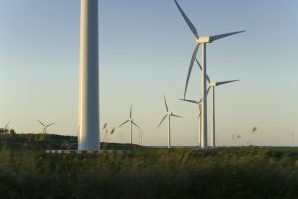 Choosing two may cause more contention for available resources in more heavily-loaded systems. Specify the size of your disk. Use the virtual machine’s location for storing the disk. Choosing Bridged will allow the VM to have access to the same network as your host PC’s primary interface. This is a good choice for testing. Click "Don’t Add a Floppy Drive"
Click "Don’t Add a USB Controller"
Press Finish to complete configuration/creation of the VM. Obtain the ISO image file for your guest operating system. Click once on the host system (your current machine host name) on the left. Type in a name for the datastore, we picked "ISOS"
Type the directory path, we used "C:\ISOS"
Click OK at the bottom to save your changes. Click once on the CD drive icon and click "EDIT"
Click the ISO Image option and select "Browse…"
Select the ISOS datastore and select the ISO containing your guest operating system installation media. Install your guest operating system as you would on a physical machine. Use the console tab to continue your installation. 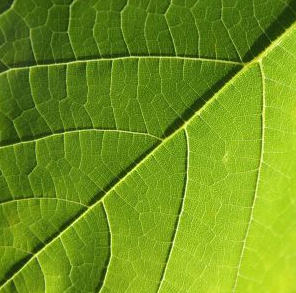 The Beta or "experimental" version of VMware server can be a bit flaky in testing. I have often noticed times when a VM (which previously ran perfect under VMware server 1.0.x) sporadically died or quit responding. The Beta or "experimental" version has been known to expire. I believe they fixed this with the latest beta release (at the time of this writing). The previous versions were expiring leaving the user unable to power on VM’s and ultimately having to reinstall. The Beta version also runs every VM in a slower "Information Gathering" mode. This debugging mode greatly affects performance. It is recommended to disable each VM’s debugging mode under "Configure VM" on the Advanced tab. Simply unclick the "Record runtime information" check box. The Beta version also has not been extensively tested with Virtual Infrastructure Client but some functionality works. The main difference between ESX and regular VMware server is that ESX runs its own VMware kernel (loaded with GRUB) and allows for the virtualization technology to live closer to the hardware. VMFS, available in ESX, allows for larger files and offers higher performance over traditional file systems like EXT3. VMFS is tuned for large files and exhibits almost raw filesystem speed. The ESX console is simply another virtual machine which has access to the VMKernel (through hostd process) and allows for management of the host. This console provides SNMP monitoring and all management functions for manipulating guests and the host configuration. Three types of network connections. VMKernel maps VM to physical adaptors based on the source MAC hash. This method has low overhead but might not effectively spread the load to all physical adapters. VMKernel routes outbound and inbound traffic based on IP address. This requires VMKernel to inspect packets at Layer-3 and can introduce more CPU overhead and might not be the best option for high-throughput applications.